CRISTAL HABITAT CHAMBÉRY AND IPSILAN-NETWORKS HAVE CHOSEN COREBRIDGE SUITE SOLUTION TO INTEGRATE MITEL PBX WITH THE CRM ARAVIS. In partnership with IPSILAN-Networks and ACG Synergies, the Corebridge Suite solution has been deployed at Cristal Habitat Chambéry to improve the quality of customer relationship. The Port of Long Beach (Los Angeles, California) deploys the Corebridge STAR gateway for the integration of Cisco Call manager with Microsoft Skype for Business. The Port of Long Beach has deployed the Corebridge STAR Gateway solution for 600 users in Microsoft Skype for Business and Cisco Call manger 11.5 environments. The STAR gateway doesn’t require Microsoft Remote Call Control mode (RCC) and it works without the need to create a SIP trunk in the PBX level. HABITAT 25 and BOURG HABITAT have chosen Corebridge Suite solution to integrate Alcatel with the CRM ARAVIS. In partnership with NextiraOne and ACG Synergies, the Corebridge Suite solution has been deployed at Habitat 25 and Bourg Habitat to improve the quality of customer relationship. The group STERENN&CO has chosen the Corebridge Suite solution to enhance the quality of customer relationship. STERENN&CO group is leading company for the distribution of farm equipment and spare parts in France, Spain and Benelux. HESNES GROUPE (NORWAY) HAS CHOSEN COREBRIDGE STAR GATEWAY SOLUTION FOR THE INTEGRTION OF ALCATEL-LUCENT PBX WITH MICROSOFT SKYPE FOR BUSINESS. The group has signed a 3 years support contract for the deployment of the STAR gateway solution in Skype for Business and Alcatel-Lucent environments. The solution was chosen for its ease of installation and management as well as for savings the infrastructure costs. VOIP PTY has offices in the main cities of Australia (Sydney, Melbourne, Canberra, Brisbane, Adelaide and Perth). VoIP Pty is a certified Microsoft, Cisco and Alcatel-Lucent partner and is specialized in Unified Communications and Mobility solutions. Irwin Mitchell group has chosen the Corebridge solution to enhance the quality of customer relationship. The UK-based Irwin Mitchell law firm has deployed Corebridge solution and signed a service contract for system migration to Cisco call manager CUCM 9.1. Irwin Mitchell has 17 offices and employs over 3000 people including 2100 attorneys. With the previous choice made by the Chambers of Commerce and Industry of Paris, Lyon and Bayonne, this is the confirmation of the value of Corebridge solutions for this sector. The Port of Long Beach has decided to deploy the Corebridge COGS solution in Lync 2013 environment with Cisco Call manger. The COGS solution has been chosen for its ease of installation and management as well as for savings the infrastructure costs. The contract for 3 years will furthermore allow the migration in 2018, to Skype for Business with the STAR gateway solution. Corebridge extends its network in North America by signing a Commercial Agreement with a Canadian Partner : Capella Telecommunications. 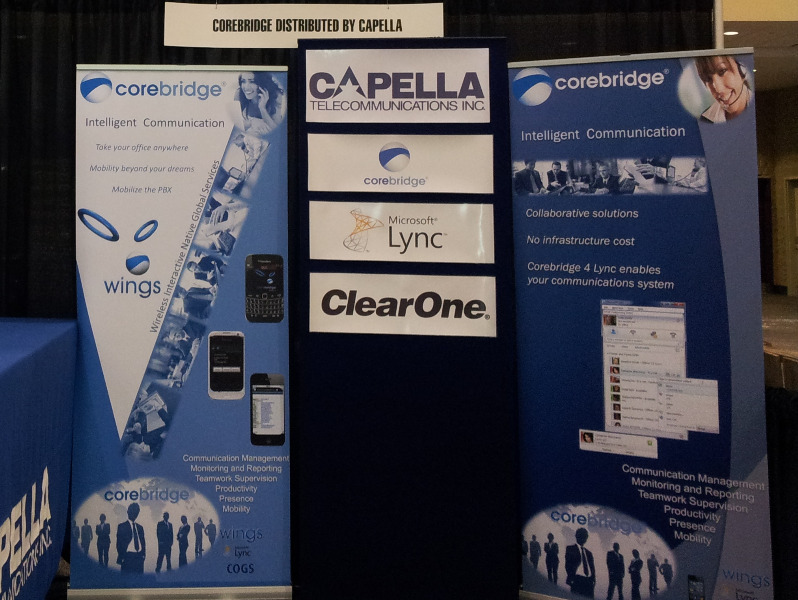 Corebridge sign with Capella Communications. 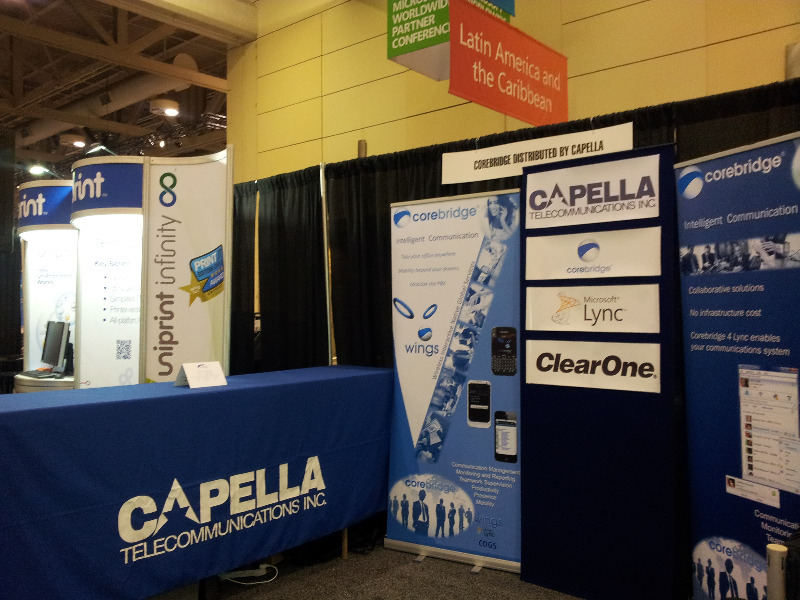 Capella Telecommunications is a Canadian company founded in 1993 and provides products and services in the telecommunications industry. Capella is the leading distributor and systems integrator of video, voice and data products. 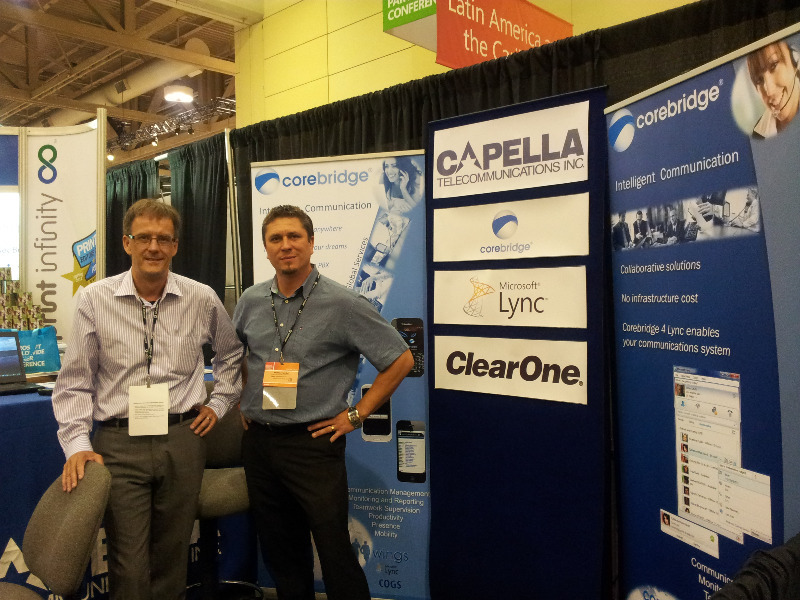 Capella has signed a partnership agreement with Corebridge to distribute Corebridge Suite and Wings in Canada. Fidessa enhances its contact center with Corebridge solution. The Anglo-American finance company Fidessa has chosen Corebridge to enhance operating information about its contact center. With the real-time supervision module Coreteam and Corepilot for Avaya ACD, Corebridge allows Fidessa to have a complete supervision of the telephony activity of its counselors, including the reasons of their unavailability to take calls. Asia’s businesses are going to be vastly different in the near future. Today’s CFOs need to know what’s coming up the pike to plan how best to manage the change. European technology company, Corebridge, credits much of its business success to Hong Kong's efficient business platform. Corebridge is proud to announce Offshore Incorporations HK Limited (OIL), Asia’s leading offshore company formation specialist, as the newest member of the Corebridge family. With OIL’s rapidly growing business has come the need to improve control of their communication environment. Critical to their business is the ability to identify who is calling in (integrating with their in-house database), to track agent’s telephony statuses and call activities, and finally, during peak times, to use the real-time tracking tool to log who is in the call queue. OIL searched the market for a solution that addressed their requirements. Their search culminated in Corebridge being awarded the contract in December 2015. Corebridge in partnership with PCCW, Hong Kong’s dominant telecom company, delivered a turn key solution to OIL. The Corebridge proposal met OIL’s requirements head-on. Firstly, Corebridge’s proprietary synchronising agents allow OIL to integrate telephony with their existing database so that incoming calls are identified immediately. CoreTeam, a real-time telephony and computer status tracking tool, allows supervisors to track their agents’ productivity. “Before Corebridge, it was difficult to measure the efficiency of my in-house sales department to ensure that we provided the best service to our valued clients. We now have a real-time view of their telephony activity which allows me to manage my team more effectively,” says Suzanne Callister, Senior Vice President of Sales and Marketing. The benefits of Corebridge were recognised by OIL within the first week of installation. We are happy to announce another satisfied Corebridge customer and look forward to building our relationship with OIL for many years to come. Corebridge in South Korea. Through its new Korean integrator partner Ablecom Co, Corebridge is deploying 3500 COGS licenses for a Korean public company on an Alcatel platform. Corebridge is already in 14 countries on the Asian continent and is extending its geographical presence in South Korea with this new partnership. Corebridge distributed by Televersal/Voice Access.Televersal/Voice Access group, the new leading telecom distributor in Benelux, has decided to add the Corebridge solutions to its product portfolio. Televersal/Voice Access provide solutions to 600 IT and Telecom resellers in Belgium, the Netherlands and Luxembourg. With Corebridge, Televersal/Voice Access can offer a unique solution to connect business applications to the telephony infrastructure, whatever the telephony vendor. The visitors were impressed by the efficiency and the simplicity of implementation of COGS, the quality and the richness of CB4Lync and the never seen innovation of WINGS. Many contacts were established. New tracks as the response to the needs of emergency call services (E911 program) have been opened to thoughts and developments. 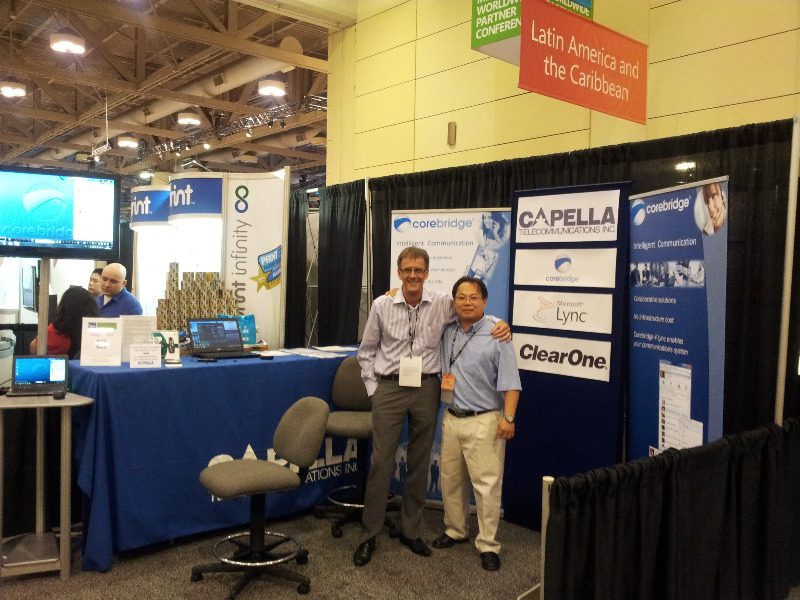 Capella's Corebridge Solution is highlighted by Tom Cross, CEO of TECHitionary and Lync User Forum. Read why Corebridge's COGS solution is considered a "must-see" at the upcoming Microsoft WPC show. HRL has equipped all of its employees with the solution COGS. The belgian company OZ, specialized in health and leisure, has chosen Corebridge to ease the use of phone in its dedicated call center. The integration of Corebridge allows every agent to be more efficient in the customer relationship on a daily basis. Concurrent Technologies Corporation (US) has chosen Corebridge COGS solution. CB4Lync – Corebridge for Lync is the latest innovation in both concept and design of Microsoft Lync integration with company existing telephony infrastructure without the need to upgrade or to replace PBXs. BOCC – Branch Office Call CenterBOCC is a software-based call distribution solution which enables user “On-demand” to automatically route his/her own incoming calls to specific internal colleagues or group of users. BOCC server dispatches incoming calls to the first available colleague, or to colleague with an appropriate skill in an order of priority that user can set. This, in turn, allows workloads to be balanced between colleagues and enhances the customer experience by ensuring prompt and professional service. Colleagues’ availability is determined from a combination of their personal availability, PC presence and telephony status. BOCC features could be activated in toggle mode in liaison with the user desk phone. Hence, in case of user absence he/she can turn his phone to act as a personal call center “a mini office ACD” to route inbound calls to appropriate colleagues based on their skills and their availability. Cairo (Company Automatic Intelligent Routing) routes company incoming calls in accordance to specific internal contacts, company own rules and automatic call distribution based on agents’ skills and callers’ preferences. In addition, all calls can be automatically routed to users’ mobile location in case of emergencies. Cairo improves companies’ productivity by providing a comprehensive control tool allowing production managers to gain insight into improved operating efficiencies. Cairo’s operations are based on working time, activities and business processes at the companies that deploy it. Main Benefits are : - Call routing based on specific internal events; - Automatic Call Distribution; - Business Continuity Telephony Processes in case of Disaster Recovery Plans. Innovation in the Unified Communications !COGS is a gateway solution that leverages Microsoft Lync 2010 and Office Communications Server (OCS) remote call control capabilities. Datapoint, services company and one of the most important integrator of Avaya solutions in Europe, sign a strategic partnership with Corebridge for the distribution and the support of Corebridge solutions. CLSA has deployed since 2006 the advanced telephony functions allowing in particular to serve “On-demand" the technical information messages pre-recorded at his customers in multiples contexts of relationships with its advisors and customers. The quality, the pertinence and the use simplicity’s of the solution installed by Corebridge allowed to increase the satisfaction of his partners, to develop loyalty of his customers and increase the efficiency of the customer relationship and his timeliness. Hardly of this experience and its results, within the framework of the evolution of the technologies IT of messaging systems, business-specific applications and its telephony, CLSA confirms the strategic location of the solutions Corebridge within his Group. With 14 environments of same configuration, on servers installed in 14 countries where is establish CLSA, these solutions lean on the last developments realized by Corebridge and on his unique CAT technology’s that allows her to be independent from telephony systems installed and of applications chosen by the customers. Forty-five minutes? Just seven years ago that seemed like an unrealistic claim. Now using Corebridge, thanks to its facility for integration with all manner of desktop applications, a launch can be facilitated the moment the phone rings. Our unified communications solutions are renowned for enabling organisations to leverage full value from their existing assets. So there may yet be a way found to maximise the nation's return on its investment in Trident. If the world's arsenals were hooked up to Corebridge, they could be launched quite securely on picking up a call or after hanging up, prompted by the hierarchies of rules that administrators set. So for a more efficient, more cost-effective, probably safer world, come to Corebridge. For the latest Mobility Monday meeting on 15 June 2009, Corebridge demonstrated the benefits of its mobility solutions at IPC Media's headquarters in London. Corebridge is demonstrating the enterprise benefits of its mobility solution, WINGS at the elite Mobile Monday innovation symposium at IPC Media's headquarters in London on 15 June 2009. One of thirteen innovating enterprises, Corebridge will have three minutes to pitch its wares in each of the meeting's three demonstration areas before an audience of journalists, analysts and potential partners. At the end of each section, there'll be chances for questions from onlookers as the process is repeated three times with the three groups of demo companies. "I'm delighted to attend MoMo London," Corebridge's CIO, commented. "Many of the innovations in this space are aimed at social networking and the Web 2.0 arena. Corebridge can stand apart because WINGS is an enterprise software solution. It has the potential to deliver communications-enabled business process work flows to remote workers. It's an exciting prospect and one I'm looking forward to demoing at the event." Published in March 2009, Microsoft's white paper, Integrating Enterprise Telephony with Office Communications Server 2007 R2, references Corebridge OCS Gateway Server (COGS) as a primary option for leveraging Microsoft Office Communications Server 2007 R2's remote call control capabilities without any need to upgrade or replace PBXs. Users of Office Communicator can drive desktop phone activities from the Office Communicator client. Any telephone number in any Microsoft unified communications-enabled application can be clicked to call via PSTNs. COGS enriches the Office Communicator presence bean with the injection of telephony presence, enabling users to make better communications decisions. The results are: •significant cost savings; •increased return on investment for existing PBXs; and •extended longevity for existing infrastructures. With no licensing fee, just a minimal annuity for maintenance and support, COGS minimises the cost of UC-enabling workplaces and maximises the potential for realising returns on investment in communications hardware. Corebridge has been nominated as a finalist in Innovate!Europe’s search for Europe’s top start-up the next stage of which is to be held between 4-6 May 2009 in Zaragoza, Spain. As an Innovate!Europe finalist, Corebridge has also qualified to participate in the Innovate!Europe Trade Mission to Silicon Valley in early June 2009, introducing finalists such as Corebridge to venture capitalists, private investors, bloggers and media, and facilitating access to financiers, partners and service providers. The Corebridge's CEO commented, "Following on from Corebridge's successes as winners of a Red Herring Global 100 Award and at Web Mission 09, it is a great pleasure to receive another accolade for its innovative excellence at the beginning of this second quarter. "2009 is shaping up to be our most successful year yet. We are delighted that Corebridge's pre-eminence as one of Europe's more vibrant young businesses has been consistently recognised and I'm looking forward to participating in the next stages of the Innovate!Europe competition this summer." Whilst representing Corebridge on UK Trade & Investment's Web Mission 09, Corebridge's CEO outlined the advantages of deploying Corebridge and the rapid returns on investments it realises in conversation with the founder of FreshNetworks, Charlie Osmond. Read more about Corebridge at Web Mission 09 in Charlie Osmond's blog. The fast increasing number of Corebridge users and the significance of the companies we are working with have enabled us to broaden the scope of our focus on client activities in order to react ever more in keeping with our customers’ needs. Thus, Corebridge in Paris is pleased to announce the creation of the Corebridge Users’ Solutions Club, called Coregalaxy, for its customers on the Continent. At first the club will be composed of senior representatives from the following corporate customers: • CCI Lyon • CCI Bayonne • CCI Paris • SEGC • SCPP • Alacatel-Lucent • LCF Rothschild • JPG • SCH Habitat • CMA - CGM • EST Multicopies • Belharra • Michael Page • Quiksilver The club, lead by the General Manager - Continental Europe and by Mr Emad Said, Chief technical Officer and Corebridge's Co-founder, will be welcoming new members as it matures and as new customers choose to deploy our solutions to address their strategic needs. Coregalaxy's objectives are: •to encourage the exchange of information between Corebridge users; •to fulfil and propose enhancements and innovations for which users ask ; •to discuss experiences of the way in which Corebridge products are used; •to share strategic information about products and future plans; and •to encourage discussion about developments in the CTI and unified communications fields and the benefits expected. A one-day annual meeting will be organised to further Coregalaxy's purpose. San Diego, California - Following a successful presentation before its distinguished panel of judges, The Corebridge's Chief Information Officer was pleased to collect the prestigious Red Herring Global 100 Award on behalf of the company at a ceremony in San Diego on the night of 16 January. "It was my great privilege to accept the Global 100 Award tonight from Alex Vieux, the publisher of Red Herring," did he said. "It's the greatest award Corebridge has received so far and our achievement is the result of the hard work that each member of staff has put into our company." The Red Herring Global 100 Awards competition recognises young companies whose performance and potential are outstanding. The Red Herring editorial team’s detailed process whittles down a pool of 1,800 eligible companies from all over the world to the one hundred annual recipients of their global award. Quantitative and qualitative evaluations are made on criteria such as financial performance, innovation, management, global strategy and ecosystem integration. Corebridge’s successful competition entry was based on its significant revenue growth in 2008 and its trailblazing development of the Corebridge OCS Gateway server, which enables the OCS client to issue commands to a private branch exchange (PBX) or telephony switch so that OCS users can drive desktop phone activities from the Microsoft Office Communicator client. In this way Corebridge leverages Microsoft’s applications to incorporate legacy telephone systems in any organisation’s unified communications work flows. "We were so pleased to announce Corebridge as a Red Herring Top 100 Global Company," commented Red Herring publisher Alex Vieux. "Difficult as it was for us to narrow the field down, Corebridge excels in its industry and we are pleased to have included it in our list of promising companies. We look forward to the changes it makes to its industry in the future." Delighted by the news, Corebridge's Chief Executive Officer commented, "Previous RH100 winners have included Google, eBay and Skype. This is one of the most prestigious awards that a privately held company can win, so the significance of this success to Corebridge is self-evident." London – Corebridge, today announced that it has been selected as a Finalist of the Red Herring 100 Global Award. Corebridge, a Microsoft Accelerator Program partner, attends Microsoft's exclusive Future of Startups gathering at City Hall's Global Entrepreneurship Week event. Microsoft's case study demonstrates how it is supporting Corebridge to bring its innovative product to market. City AM business columnist, Julie Meyer, the chief executive of Ariadne Capital profiles Corebridge and its CEO. The latest edition of Zillion Business Review features Corebridge as an exemplar of CEBP technology. Corebridge's CEO is interviewed by the Financial Times regarding investment in the technology, media and telecoms sectors. Corebridge, the foremost provider of Communications-Enabled Business Processes (CEBP) technology, is to attend the IP Convergence Expo in Paris, the industry showcase for telecoms and IT solutions, from 3-5 October 2007. The three-in-one event promises to help visitors understand the stakes involved in deploying convergence technology, to assist in defining organisational needs, and present VoIP, mobile office and M2M solutions that will put organisations at the cutting edge of efficiency. Taking its place alongside more than 270 exhibitors, Corebridge will be demonstrating its solutions at stand H77 in Hall 5 of the Porte de Versailles. Visit Corebridge’s team there to discuss how our CEBP solutions can help revitalise legacy telephony and business applications and streamline business processes for rapid returns on investment. Steve Ballmer, Microsoft CEO, announced the Startup Accelerator Programme to help new UK software companies with marketing and sales support. Microsoft's Startup Accelerator Program will help startups use software technology such as Silverlight and Live Services. The Pacific region's leading CIOs and senior IT executives are gathering on 12-13 September at the Hong Kong Convention and Exhibition Centre’s Old Wing to explore and discuss the trends and issues they expect to significantly shape the CIO role in the coming year. The forum’s theme is ‘Driving Growth with IT Leadership: Innovation, Flexibility & Collaboration’. CIO Forum Asia 2007, of which Corebridge is a Diamond Sponsor, offers an informed and original perspective on pressing issues on the CIO's agenda, including: •nurturing an environment of innovation and maximising productivity through flexibility and collaboration; •identifying the key challenges facing business innovation and collaboration exercises, and how to cope with these conditions; •locating high value focus areas that drives top and bottom line growth in a business; •moving beyond IT alignment and developing business improvements; defining the performance criteria of measuring how successful CIOs have been in building the right relationship with the business; and •making leadership personal - taking it beyond the corporate walls. Telephony, business applications and specialised voice recording technology combine in a simple, converged solution. Who Dare Wins: Corebridge is numbered amongst the UK's brightest and fastest entrepreneurs. Silverbeck Rymer selects Corebridge's solution. Corebridge, winners of The Sharp Edge SpinVox Award for Innovation and Creativity, will be attending the Technology in Recruitment event at Le Meridien Hotel, Piccadilly, in London on 12 April 2007 alongside its partner, RSS. The Corebridge's Sales Manager for the Recruitment Sector comments, "Ours is a global business at the forefront of the burgeoning market for Computer-Enabled Business Processes (CEBP). We are pleased to be attending the free-entry Technology in Recruitment Forum this year alongside our partner, RSS. "RSS's software is a powerful searching, tracking and scheduling tool for the busiest offices and for agencies of all sizes." By linking Eclipse with corporate telephone infrastructures, Corebridge adds the extra dimension of speed. As soon as a call is made, Corebridge will cull relevant records from Eclipse and present them on-screen instantaneously. Visit www.corebridge.com for more information on how Corebridge can help your company achieve the full benefits of convergence quickly and cost-effectively or contact us. Churchill Networks Offers Voice-Enabled Business Processes Using LignUp SOA-Based Communications Application Server, Yahoo! Finance. Churchill expands Business Service Portfolio with LignUp and Corebridge Integrated Communications. The Third Banking and Finance Technology Forum 2007, Computerworld Hong Kong. The Corebridge's CIO comments on the growing availability of CEBP technology and the viability of its application for all enterprise knowledge workers. In association with Convergence World magazine, the International Engineering Consortium (IEC) today announced the finalists of the Convergence World Awards. Corebridge will be a major exhibitor at the 9th Journée des Solutions Bancaires (Banking Solutions Day) at the Bâtiment des Forces Motrices (BFM) in Geneva on 21 March 2007. The theme of this year's event is "Constraints, risks, and opportunities" and Corebridge, which has just won the 2007 Sharp Edge SpinVox Award for Innovation and Creativity, will be demonstrating its solutions at the show in Switzerland's historic financial capital. Corebridge has been announced as a finalist in the Best VoIP Product category by the judges of the Convergence World Awards, which are to be presented at a ceremony held in Milan on 27 March 2007. The Corebridge’s Chief Executive Officer commented “Convergence World is widely recognised as the voice of our industry. Following our success this February winning the SpinVox Innovation and Creativity category at The Sharp Edge Awards in London, it is a great pleasure to be distinguished by nomination for these inaugural awards in Milan. Corebridge has been chosen from a high number of entries. It is nominated alongside some of the convergence industry’s biggest names as one of the organisations that is leading the way in reshaping communications globally." The annual conference of the Law Society of Scotland is being held at Edinburgh’s Cromdale Hall on 2 March 2007. Corebridge, which has just won The Sharp Edge SpinVox Innovation and Creativity Award will be attending the event with its partner, TFB plc, the leading legal software supplier. Corebridge with TFB benefits legal organisations by increasing their efficiency, productivity and client satisfaction and saving them time, duplication of effort and unnecessary work. Corebridge can enable and facilitate the rapid and cost-effective improvement of communications. By providing timely access to integrated client information, Corebridge with TFB enables legal advisors to provide a personalised client service and offer great client value. On the evening of 19 February at Quaglino's in London, Duncan Bannatyne and boutique publishers Jack Spaniels were pleased to announce the winners of the inaugural Sharp Edge magazine awards. Corebridge's CEO accepted the SpinVox Award for Innovation and Creativity at the presentation dinner, which was attended by scores of Britain’s most successful entrepreneurs and brightest business leaders. Commenting after the event, the CEO expressed his gratitude to the competition's organisers and judges for the honour. "We have always derived strength from our belief in the innovative nature of our product and the creativity of the teams that work in Corebridge's offices worldwide. It is very satisfying that the product which we have worked hard to bring to the global marketplace has been be recognised in our first full year of trading as a global concern." Competition judge, Duncan Bannatyne said, "It is fantastic to welcome so many great businesses to the Awards and to be able to recognise their extraordinary achievements. The Sharp Edge was established to provide an inspiration to entrepreneurs and I hope these Awards will do the same." 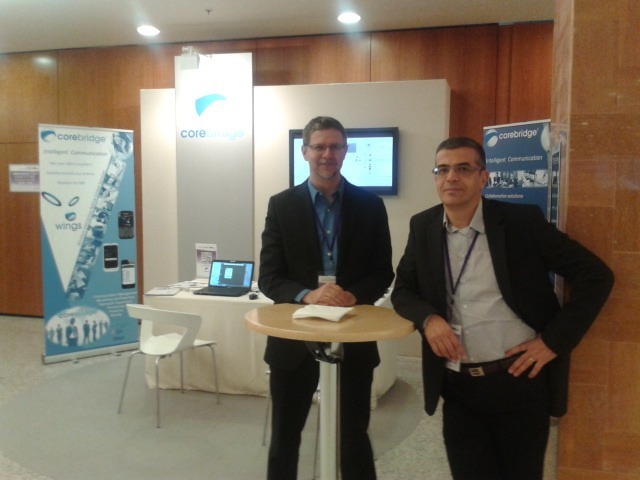 Corebridge establishes its second French office at Lyon, France's communications hub. Corebridge is pleased to announce the development of its presence at a second French office in Lyon, France's second largest business capital after Paris. Home to more than 100 new information and communications technology companies that employ 2,000 people, the city of Lyon is the driving force of the Rhône-Alpes region which is regarded as France's equivalent to Silicon Valley. Corebridge's Lyon office is headed by Alexis Garin who, having been a Client Executive at IBM for four years, has managed software and services companies in Lyon for the past six years. “Lyon’s SME market is one of the most dynamic in France - all sectors are represented. I am convinced that many organisations would benefit from implementing Corebridge integrated communications solutions,” commented Mr. Garin of Corebridge's opportunities in its new location. The Corebridge's Chief Executive Officer, commented, "As a company whose groundbreaking research and development team is based in France, it is with great pleasure that we are able to announce this extension in our French operations. Lyon's pre-eminence as a centre for hi-tech industries is recognised all over the world and Corebridge's expanding presence there reflects that fact." With the rise of 4G, Corebridge's CEO, argues that convergence may be the key to business success. Network World Asia selects CLSA's solution, provided by Corebridge with Nortel, for its 2006 All Stars Roll of Honour. Corebridge signs with UK vendor TFB and reseller and consultant Tikit. Tikit announces its partnership with Corebridge to provide seamless convergence to the legal sector. Unified communications applications are fundamentally changing the ways employees can interact with each other and with customers. Subsequent to the announcement in 2005 of its partnership with TFB plc, the legal IT market’s leading software supplier, Corebridge is pleased to announce its intention to attend the Law 2006 event at Birmingham’s NEC. Law 2006, organised by the solicitors group in association with The Times newspaper, is the legal profession’s largest event and will include the UK’s largest legal training congress. Since October 2005, TFB has begun to integrate Corebridge solutions with its own Partner 4 Windows (P4W) package. 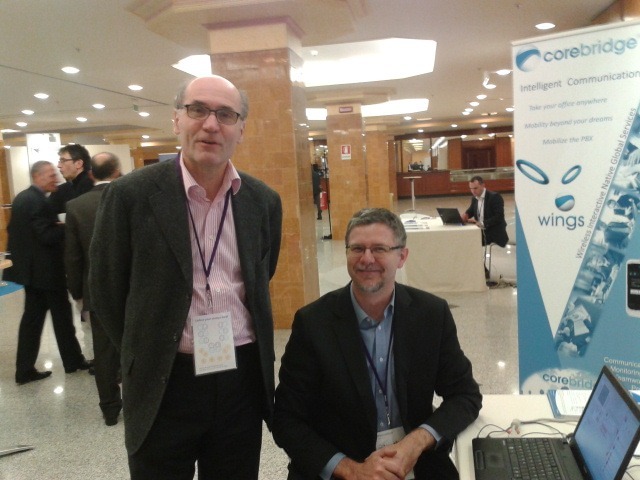 Corebridge and P4W together are already enhancing the level of software service offered to the legal sector. At the two-day event, Corebridge and TFB staff will be on hand to demonstrate the potential of Partner 4 Windows and Corebridge to hundreds of Law 2006 delegates from some of the most significant legal partnerships in the United Kingdom. Corebridge recruits new custom in partnership with SRP Corebridge is pleased to announce new developments in its partnership with the award-winning, directed communication networks specialists, Services Reseaux Professionnels (SRP) of Lorraine in France. 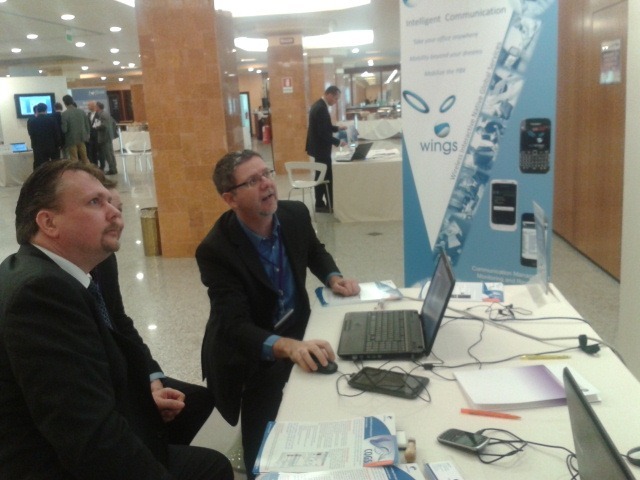 Chaired by Marc Lienhardt, SRP has specialised in directed communication networks since 1992. Like Corebridge, SRP prides itself on its ability to offer tailored technological solutions to its customers. SRP’s product helps its customers to exploit integrated voice, data and image networks effectively. 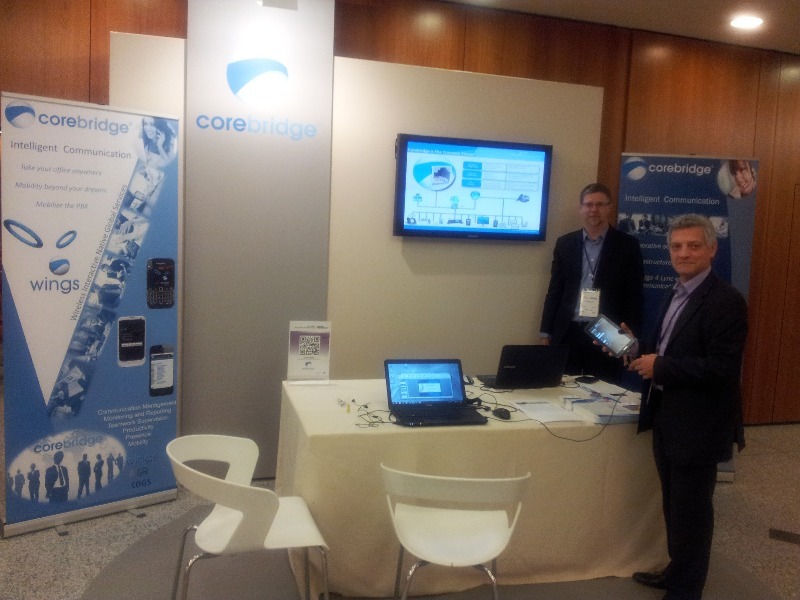 Emad Saïd of Corebridge comments, “Corebridge is very pleased to have developed a working partnership with SRP. It selects its partners across the world carefully and independently so that its customers receive the best products that the market can offer and so that they achieve the best performance possible to meet their businesses’ needs. I can’t think of a more satisfying endorsement than that.“ For its part, SRP view’s Corebridge’s integrated communications solution as a strong value-adding product that complements its own CTI offering perfectly. As a result, SRP has ordered 20 Corebridge licences for its customer ADH, the recruitment agency. “At the heart of SRP’s strategy is customer relations. Before we install any new system, our professionals examine in detail with our customers why and how new technologies will support and benefit their company strategy. If we recommend Corebridge to our clients, it’s because we know it’s absolutely right for them,” says Mr Lienhardt, SRP’s President and Director-General. Anélia and Corebridge have strengthened their partnership to improve customer relationship management by offering second-generation computer telephony integration that is described by its developers as "Integrated Communications". “Corebridge and Anélia are introducing non-intrusive technology that bridges the gap between voice and data applications and improves the productivity of each knowledge worker by communicating the information from voice and data channels to a single, user-friendly interface,” explains Corebridge’s Sales Director in France, Benjamin Bessah. Corebridge offers intuitive and automated access to critical information systems and trade applications. “By non-intrusive, we mean that our software doesn’t affect other systems in place, so there is zero risk for the end-user. By linking all the telephony and software components of an existing infrastructure, Corebridge optimises workflows across an enterprise, and brings value to all existing systems,” says Benjamin Bessah. Corebridge unifies contact databases in a central unified directory, allowing the user to instantly search for any contact from any database in a single unified display. By integrating the Corebridge application suite to Microsoft Outlook or IBM Lotus Notes, any e-mail can be answered by a phone call, and any missed call can automatically generate a notification e-mail. Deployment is quick and easy, taking on average three to five days. TFB, the market-leading supplier of IT solutions to lawyers, has announced its recently established partnership with Corebridge, the authors of the next generation of business communications software. This association will see Corebridge bring a new dimension to Partner for Windows (P4W), TFB’s case and practice management solution. It will allow users access to the most advanced modes of computer telephony integration (CTI). TFB’s market strength is credited to P4W and the versatility of its design, which can be tailored to each individual firm’s requirements. This flexibility also lends itself to the seamless incorporation of other add-on solutions into Partner for Windows. Corebridge’s technology is the very latest to achieve easy integration with P4W. Simplicity and efficiency are the cornerstones of Corebridge’s call management and messaging synchronisation applications. All communications, whether e-mailed, faxed, telephoned or recorded by voicemail, are consolidated and displayed in the existing e-mail application and in Corebridge’s own communications logs. As an introduction to Corebridge’s productive potential, the next release of TFB’s P4W software will include Corebridge’s ”CoreClick” technology. It will allow P4W’s users simply to highlight a contact’s number in any program on their screen and Partner for Windows/Corebridge will offer to call the number direct from their desktop. Subsequently, the range of Corebridge’s CTI solutions will be available to TFB users. This will include having P4W start a time recording session or display file information automatically upon the identification of an incoming call number. “The usefulness to legal practices of having call data recorded clearly on-screen is obvious,” commented the Corebridge’s Chief Executive Officer, “and Corebridge complements the accounting, document management, time recording and billing modules of the Partner for Windows Suite perfectly.” ”We are pleased that we will have this opportunity to demonstrate Corebridge’s power and versatility as part of TFB’s bespoke solution for the legal sector. Our application can add significant value to TFB’s range of practice management solutions and contribute to a rapid return on investment for its users.” TFB is always looking for new products that can help their clients to achieve legal excellence in their own field of expertise. The company is confident that this latest addition to the product portfolio will further enhance the level of service that it offers. Telecommunications solutions provider Corebridge has set up its Asian headquarters in Hong Kong. The company is based in Paris, with operations in London and Bahrain. Its new Hong Kong office will be responsible for building the company’s business throughout Asia-Pacific, recruiting highly qualified talent to add to its existing team. Corebridge produces a best-of-breed integrated communications application that connects telephony and data systems to provide real-time caller identification, rules-based call routing, and integration to existing business applications based on call events or user inquiry. The Corebridge application can provide unified communications between email, telephony, fax, SMS and voice mail and can be used by any company with its own telephony system and email. Corebridge enhances business processes and work flows by linking information with phone events automatically. The result is increased staff productivity, enhanced customer satisfaction, and tangible cost savings to any enterprise dealing with customers, third parties, or large volumes of data. Advances in Communications Technology - 2005 and Beyond. Paris, France – (21 February 2005) – Corebridge, which has become one of only eight Global Tier One partners to 3Com, is attending the 3Com-U-Live event, which is being held in Las Vegas between the seventh and the thirteenth of March. The event, which is being organised by 3Com Marketing and Educational, aims to bring 3Com closer to its partners and customers. The conference will host three hundred 3Com partners who service small, medium and large enterprises in North America. The event’s theme is, "Exercise Choice", and it will offer visitors a chance to see 3Com’s world-class wired and wireless, voice and data, network and convergence applications demonstrated. 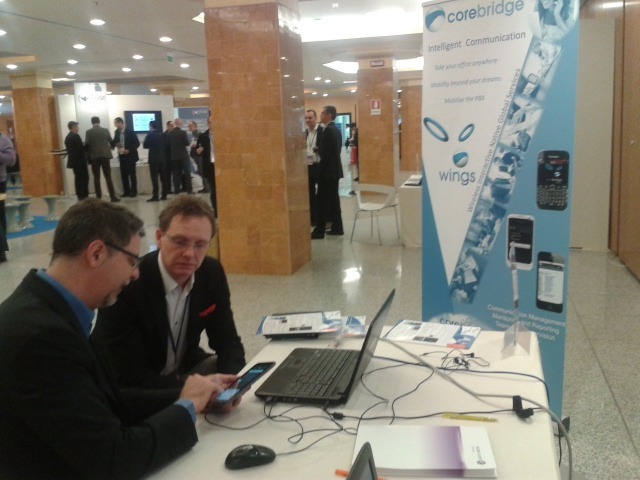 Paris, France – (21 February 2005) – Corebridge was well received at the 6th Annual Customer Contact Solutions Forum in London on the twenty-third and twenty-fourth of February. The event brought together Customer Services Directors, Contact Centre Directors, Operations Heads and IT Directors to discuss contact centre optimisation and how to deliver low-cost strategies that can be implemented immediately. Corebridge recently exhibited in Cannes at Networkers 2005, Cisco's user conference and the most important annual gathering in the networking industry. Attended by more than three thousand network professionals from all over the world, the Riviera convention presented an opportunity for visitors to receive training and gather information about Cisco's technologies, solutions and products. Conference-goers could also find out what network technology Cisco’s partners have been developing, building, designing and planning. Corebridge demonstrated its complete solution, from server software and administration tools that work with Cisco CallManager to the end-user client application which works with Cisco's latest IP phones. Corebridge’s key staff members were on hand to present their market-leading integrated communications system to industry peers and were pleased to establish new contacts with more than thirty companies, potential partners and customers. Prior to the event, Corebridge already enjoyed a privileged relationship with Cisco, having a joint solution showcase in the prestigious Cisco demonstration centre at Tower 42 in central London. 11 May 2009 The ChannelNews website in France interviews the Corebridge's General Manager for Continental Europe. A translation follows. For the original article about Corebridge please follow this link: L'odyssée de Corebridge, Channel News.fr website The Corebridge Odyssey 11.05.09 - Dirk Basyn Corebridge has signed a partnership agreement with Microsoft for its OCS Gateway Server solution. A deal for the Anglo-Saxon offshoot of a company that was born in the laboratory of France Telecom. No one is prophet in his own land. This old saying is especially appropriate in respect of Corebridge's odyssey. In the 'nineties, development agreements between IBM France and France Telecom gave birth to a gateway for hardware and software that enabled the remote monitoring of telephone calls. Becoming the property of both Bull and Integro, the product suffered as differences between the two companies emerged. So its creators went in search of capital investment, which they found in Britain, the Middle East and Hong Kong. The investors, asked the developers to release a 100% software solution. They did and on 1 January 2004, the Corebridge company was established in London with an office in Hong Kong and R & D based in France. In 2007, its commercial arm was reactivated in France. In the same year Corebridge was one of the first companies to be invited to join the Microsoft Accelerator Startup Program, which enables it to receive software and support from the software giant. This partnership has assisted the creation of Corebridge OCS Gateway Server (COGS), a software gateway that leverages the remote call control capabilities of Microsoft Office Communications Server 2007 R2. Red Herring Global 100 Award Very intrigued by this product, a Microsoft team from Seattle visited Corebridge in 2008. The Global 100 Award from Red Herring in January 2009 helped convince the Redmond publisher to sign a partnership agreement with Corebridge. The product is now ready to be distributed. The goal is to become a preferred solution. "All Microsoft partners can deploy our solution in the form of a COGS server. This is the equivalent of an Alcatel gateway, but as a modular software, it is irrelevant who made your PBX or what communications infrastructure you have. COGS can provide disparate telephone environments with different levels of technology. No initial investment software COGS requires no initial software investment. The customer need only pay an annual fee for support and maintenance. From their workstations, users then have access to all the benefits of unified communications (email, initiation of work flow activity triggered by call activity, conference call, voice mail, SMS ....). "Being deployed in France by Microsoft may allow us to invest in neighbouring countries such as Italy and Spain. We already have two clients in Switzerland,". Corebridge in France is back to square one in some ways, but under much better auspices. RM:	Hello and thank you for having me here; Corebridge in a few words is: 1. A French software publisher very close to its customers, 2. A market leader deployed on over 100 key large account customers in 20 countries, 3. An industrial owner of a unique and proven technology with two years ahead over its competitors 4. A start-up company in a 200% growing market per year over the next 5 years EV:	What is your focus area/sector? What are the solutions you provide? RM:	We are the leader in employing communications and multimedia in enterprise to optimize efficiently our clients. We use all available technologies on the market (phone, fax, sms, chat, video, presence, mobility...) in a single focal point and facilitate access to these technologies for all users, in line with their profession. With our solutions, our customers are accessible, reachable, effective and innovative, regardless of the infrastructure and complexity. In fact our "middleware" allows them to overcome the technical constraints to deal only with functional needs. EV:	Can you give a few examples of significant gains for your clients? RM: They are many: I will mention a four times reduction in the process of time communications management (reception, alert, routing…) and the decrease of 80% of missed calls from clients, and increasing to 35% of customer satisfaction on relationships with their associates ... and above all openings of new business models for our clients that would not have been possible without our solutions with an ROI of less than six months. EV:	As a publisher of software, how Corebridge integrate the phenomena of Saas and Cloud? RM:	We are at heart, make sure that you understand us well, we do not take care of any communication tools, they exist or are provided by IT manufacturers and Telecom sector, however we enable our clients: •	To negotiate a better rate contract of 13 000 calls per day, 400 simultaneously, 30 hours of video 1000 fax and 1000 sms per day and 150h mobile communications per day with suppliers. •	To invoice each user in accordance with his profile: either calls or call duration per day in fixed and mobile telephony, the quantity of sms sent, quantity of faxes sent and the number of minutes used on video conferencing, the number of applications connectivity, with full accessibility and level of services. In fact we are the link that allows the implementation of Cloud, private or shared, in business and, as such, we have huge growth prospects that we share with our customers and our partners. Corebridge will be present at the World Mobile Congress in Barcelona from 02/24 to 02/27 2014. Our Wings solution will be demonstrated. Corebridge relies on a new partner in the UK: Centrix UK. This company is based in Hampshire and is a certified Avaya partner and is specialized in Unified Communications solution. The certification is the acknowledgement of the work done by Corebridge to carry and statisfy the users of Cisco solutions. French company SDIS 56 has chosen to deploy Unified Communications solutions Microsoft Lync. To interconnect this solution to its existing Alcatel-Lucent telephony infrastructure, SDIS 56 has picked Corebridge and its COGS certified solution. 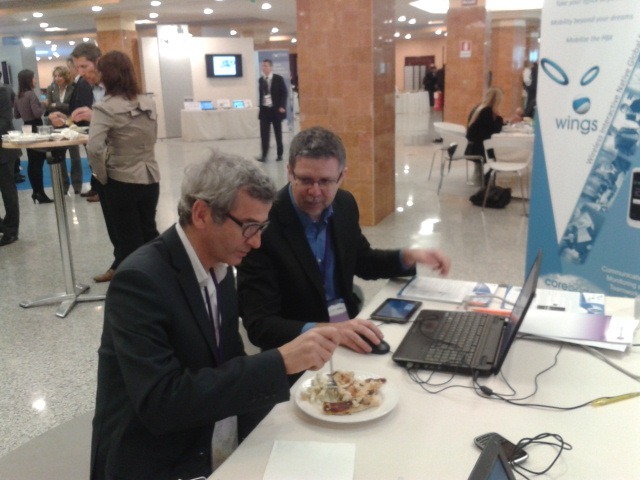 Corebridge sponsored the Executive Partner Days event that gathered in Rome on January 28th & 29th the main Alcatel-Lucent business partners for Europe, Middle East and Africa. 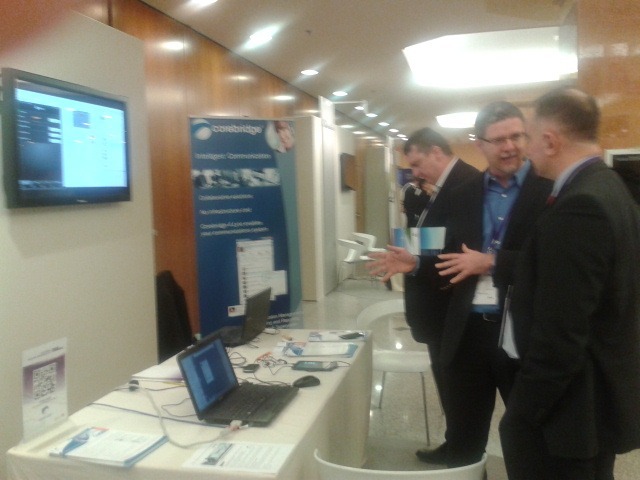 Many partners visited our booth and were shown demonstrations of COGS (certified application by Alcatel-Lucent for interconnection with Microsoft Lync) and our new WINGS solution dedicated to mobility. 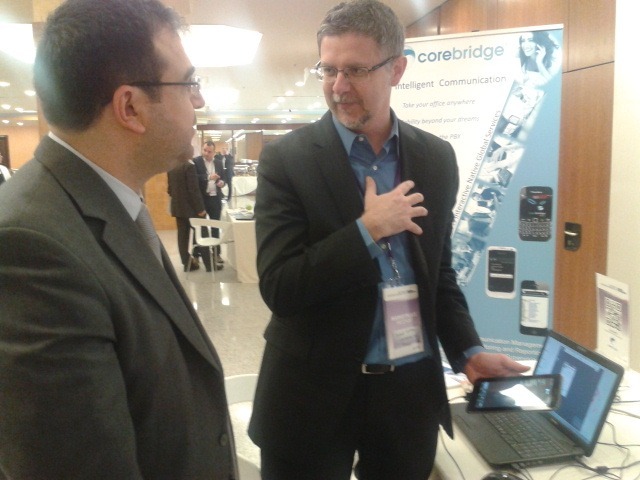 This event has strengthened the recent partnership signed between Corebridge and Alcatel-Lucent.